By Britt Gillette Leave a Comment - The content of this website often contains affiliate links and I may be compensated if you buy through those links (at no cost to you!). Learn more about how we make money. Last edited October 24, 2014 . Once again it's late-October – the time of year when the IRS announces its changes to the Roth IRA contribution and income limits. It's important to pay attention to any upcoming changes in IRS rules, because modifications to contribution limits, annual income limits, or other factors can change the trajectory of your retirement plans. So let's take a quick look at what's changed. 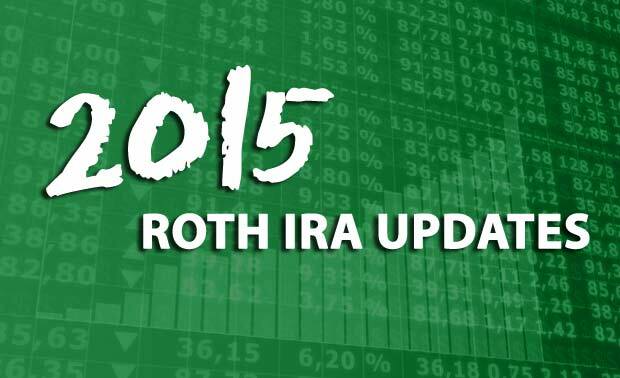 For the year 2015, the IRS kept the maximum Roth IRA contribution limit the same. This is the second year in a row that the limit has stayed the same. It last increased in 2013, when it rose to $500 more than the previous year. Keep in mind that you qualify for the $6,500 maximum contribution as long as you turn 50 years old on any calendar day in the 2015 calendar year. For example, let's say you turn 50 years old on December 31, 2015. You can contribute $6,500 to your Roth IRA for the 2015 tax year on May 1st, even though you'll technically only be 49 years old when you make the actual contribution. However, you may not be eligible to make the maximum contribution. If you earn too much, your maximum contribution limit may decrease or you may find that you earn too much to make a contribution of any amount. That's because the IRS sets income limits that determine whether or not you're eligible to make a Roth IRA contribution. And for the year 2015, those income limits will change. The 401k contribution limit for 2015 have changed. Head over to that post if you're contributing to an employer plan. If you earn somewhere between $183,001 and $193,000, then your maximum contribution limit phases out to zero based on the IRS phase out rules. If you earn somewhere between $116,001 and $131,000, then your maximum contribution limit phases out to zero based on the IRS phase out rules. If you earn somewhere between $1 and $10,000, then your maximum contribution limit phases out to zero based on the IRS phase out rules. What about Roth IRA conversions? The Roth IRA conversion rules for 2015 are the same as the 2014 rules, meaning anyone can convert a 401k or a Traditional IRA to a Roth IRA regardless of income. In years past, the IRS barred high income earners from performing Roth IRA conversions. But in 2010, Congress allowed the $100,000 income limit on Roth IRA conversions to expire. It might reappear one day. But as of now, it looks like 2015 will be another year without the conversion income limit. So if you're a high income earner who's never taken the opportunity to make a Roth IRA contribution, take advantage! Anyone, regardless of income, can make non-deductible Traditional IRA contributions, then convert those non-deductible Traditional IRA contributions to a Roth IRA tax free (since your original contributions have already been taxed). In financial circles, this is known as a “back door” Roth IRA contribution, and it's a way for high income earners to make Roth IRA contributions. However, if you choose to go this route, beware of the pitfalls. Seek the advice of a financial professional who can guide you through the process – especially if you've made Traditional IRA contributions in the past. The IRS doesn't allow you to segregate your non-deductible and deductible Traditional IRA contributions when making a conversion, so if you currently have a Traditional IRA, odds are that you'll owe taxes on a conversion. Similar to 2014, the 2015 Roth IRA contribution and income limit updates were relatively minor. The maximum annual contribution limits stayed the same at $5,500 and $6,500 respectively. However, the annual income limits increased with the range for married couples moving from $181,000-$191,000 to $183,000-$193,000 while the range for singles changed from $114,000-$129,000 to $116,000-$131,000. As of this writing, all other rules and limits remain the same year over year.